At Stuart’s our goal is to offer solutions to your indoor air quality needs. 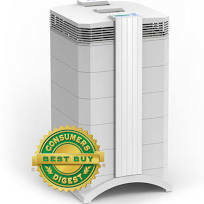 We have selected the IQAir as our #1 choice in air purifiers for one reason: THEY WORK. Below is a brief recap of some of the reasons to select IQAir. We know that there are many other air purifier units on the market and many are priced much lower than IQAir. But when someone is looking for high quality indoor air quality due to extreme sensitivity, allergies, or asthma, we think recommending anything less than a product that will actually relieve and improve their circumstances would be deceptive and dangerous. Whether you feel one or more room air purifiers would be best OR if you would like to investigate the IQAir Perfect 16 Whole House Air Purifier as seen on ABC TV Extreme Makeover, we will help you find the BEST solution for you. HyperHEPA Technology: The IQAir HealthPro Series features HyperHEPA filtration technology for superior airborne particle removal. IQAir’s HyperHEPA filtration is tested and certified to filter ultra-fine pollution particles down to 0.003 microns in size, with a guaranteed minimum efficiency of over 99.5%. This is 100 times smaller than what is achieved with ordinary air filtration technology and 10 times smaller than a virus. Certified Performance: As the world’s strictest manufacturer of room air cleaners, IQAir individually tests each air purifier to ensure that its performance meets our strict specifications. The results of the tests are detailed in a hand-signed Certificate of Performance, which ships with every room air purifier. Ultra-Quiet Design: IQAir’s “fan-in-center” design places the fan motor in-between sound attenuating filters for quiet performance. The double-walled housing effectively reduces sound transmission while rubber suspension pads systematically isolate motor vibration from the air cleaner housing. The result is an air purifier quiet enough for your bedroom. Advanced Controls: Every IQAir room air purifier features six fan speeds and allows you to program the system for automatic operation via a day/night timer. The intelligent filter life monitor precisely forecasts filter replacement based on actual usage. A sleek remote control allows you to operate the air purifier from the comfort of your couch. Molecular Control: In addition to removing pollution particles such as dust and allergens, select IQAir models are highly effective in removing molecular air pollutants such as volatile organic compounds (VOCs) and other gaseous chemicals and unpleasant odors. Timeless Design: IQAir systems follow a long tradition of European design that is bold, timeless, and beautifully adaptable to any home, whether contemporary, modern or traditional. IQAir purifiers are consistently rated the best in their class. We have an IQAir purifier in our home running all day long, and from our personal experience we do not believe there is a finer air purification product for your home on the market today. Micro-particle filtration: Eliminates micro-particles such as pollen, pet dander and mold spores. Granular activated carbon adsorption: Eliminates volatile organic compounds (VOC), which are responsible for odors. Pelletized chemisorption: Destroys harmful chemicals such as formaldehyde, by an oxidation process inside a chemically active alumina pellet.